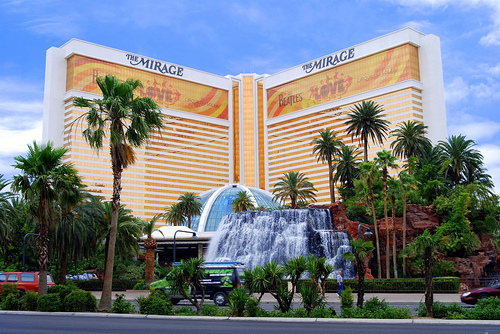 Set amidst lush foliage, towering waterfalls and sparkling lagoons, The Mirage is a South Seas oasis, offering the serenity of the tropics and the excitement of Las Vegas. A fiery volcano welcomes you to this AAA-Four Diamond resort featuring 2,763 deluxe rooms and 281 luxuriously appointed suites. Elegant surroundings, attention to detail and dedicated employees create a memorable experience whether your stay is for business or pleasure, or a little of both. Fine dining, legendary entertainment, exquisite meeting facilities and the unique jungle sanctuary for Siegfried and Roy's rare exotic animals complement the amenities of a luxurious Spa and Salon, dramatic lagoon pool, full service business center, and eclectic array of designer shops.